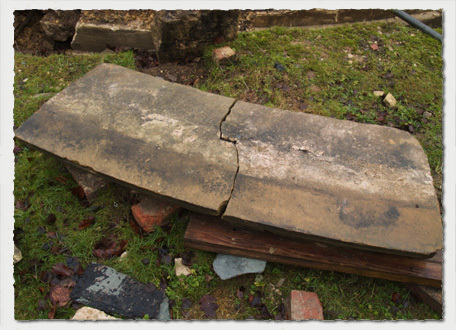 Two very substantial pieces of stonework, which turned out to be two halves of coping or cornice masonry, in sandstone, the header picture of one as it was discovered. After a considerable delay since the discovery of the stone masonry in Summer 2007, I have finally put together some graphical sketches to assist in explaining the pieces of stonework. After lifting the two pieces of stone found in the excavation area, they were re-united and can be seen as the original piece would have been when located on the head of the wall. The fracture occurred across the centre due to there being a vertical slot through the stone, running broadly in the direction of the circumferance. 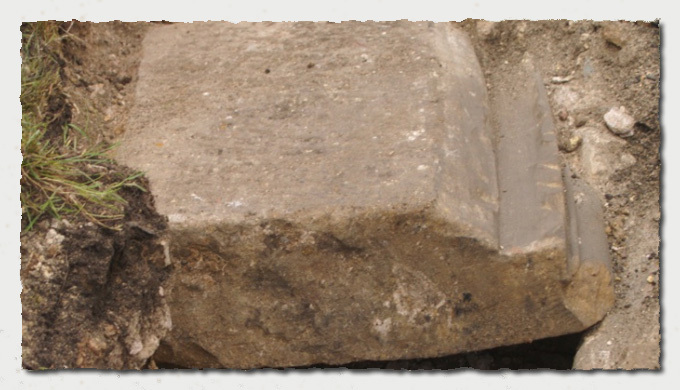 The slot, probably to anchor the stone capping above, would be a weak point and almost certainly would have caused the stone to break, either as it was being hauled off the building by perhaps a hauser or as it hit the ground. Soot marks can clearly be seen on the top surface, along with the remains of mortar from the capping stone which sat on top of the cornice. 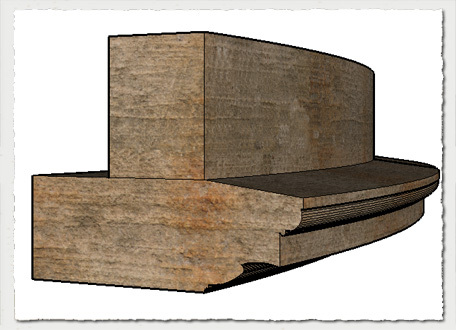 The head of the wall would have been completed with a rectangular section stone on top of the decorative coping, as shown below. Imagine the task which confronted the mason, firstly the pieces are very, very heavy, and the initial stone must have been considerably larger, before shaping. So how was it done? Well as an engineer but not a stonemason, I can readily perceive the process undertaken, and I'm assuming it was done at the site. Firstly the diameter of the Bay must have been set out on a level area of ground and the individual pieces of stone distributed around the semi-circular curve. 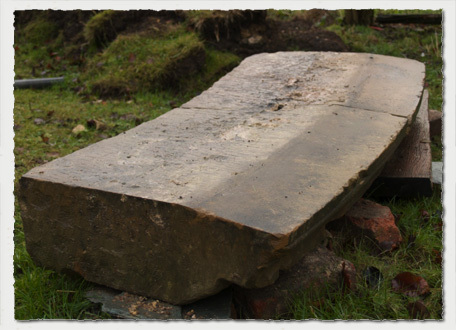 All the sections will have come from the same bed location in the quarry, and to give a scale to the photographs and sketches, the height of the coping stone is about 12 inches. Length is over 3 feet and width around 2 feet, finished dimension. 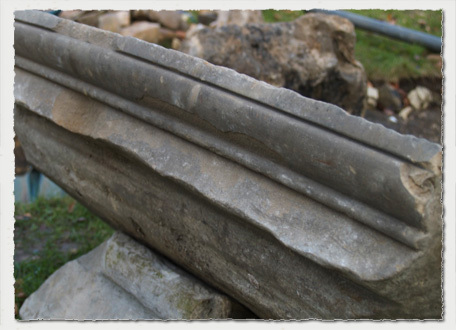 Continuing the stonemason's process, if the stones were delivered as rectangular blocks, the two faces on the ends would first need to be cut to radial lines at right angles to the circumferance. There are marks on the ends of the stone indicating face punching to facilitate the mortar adhesion. 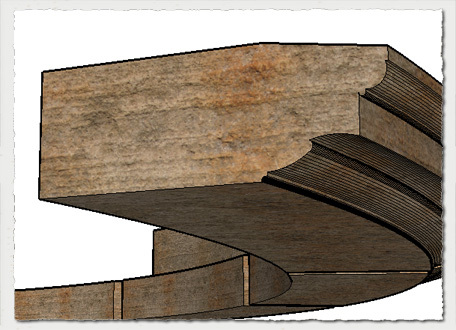 After the ends had been cut down to the required tangent to the circumference, the front and rear faces would have been trimmed to the circular outer and inner faces. Thereafter the hardest work would have involved creating the intricate moulding on the front face. Each stone would have involved many hours of careful cutting and rubbing with a selection of masons tools. The Bay Window was comprised of almost a half semi-circle attached to the south wall, I believe it was an addition to the structure, probably added sometime during the first half of the nineteenth century. Some clues as to it being an addition are that the room required a series of large steel or iron beams to support the wall at the face of the bay commencement. 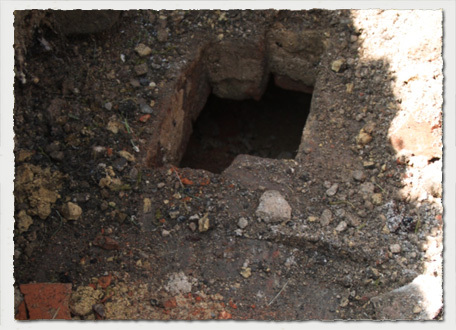 Such technology was not available at the time of the construction of the wing by Sir Edward Gascoigne in the 1720's. Also beneath the floor area of the bay window, although not confirmed in the rest of the room, is a floor structure built upon a series of parallel brick arches, thus providing a hollow core suspended floor ideal for providing a stone or marble finished surface. High contrast photograph, sadly, showing the top surface of the brickwork arch, with a hole punched through to identify the structural make up of the element. 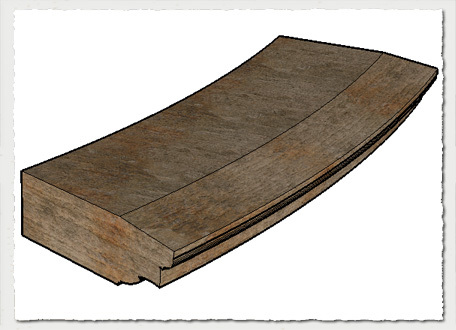 The subfloor, as was also the case under the main entrance area, was built on top of a collection of sleeper walls spaced at around three feet centres with the top enclosed in a shallow arch. 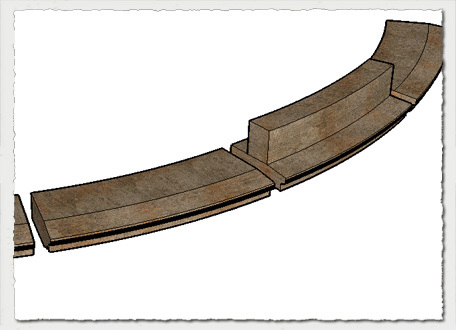 The timber centring used to support the arch during construction, would have been moved along the length of the brickwork, supporting a short length at a time, as it was built.